The Eggcellence: Snow, wind, rain, SUNSHINE! This week has been action-packed. We made it to Ohio through a light snowy drive. The cold did not stop us from enjoying Yellow Springs, Ohio. We have now made our way to sunny St. Louis, MO. Is St. Louis known for its sunshine? It is now... It's funny how first impressions make or break a place, or at least create a lasting picture. Grillin' on the fire: Anne shines, as usual, as our dinner chef. We found pok loin medalions at the grocery store. She created amazing kabobs that we had over rice. Simple and absolutely delicious. Simple breakfast at camp: Breakfast is my job. Sometimes we find avocado which makes a great simple avocado toast breakfast on bagels or English muffins. One morning we had enough avocado for half of our breakfast. The other half was peanut butter. 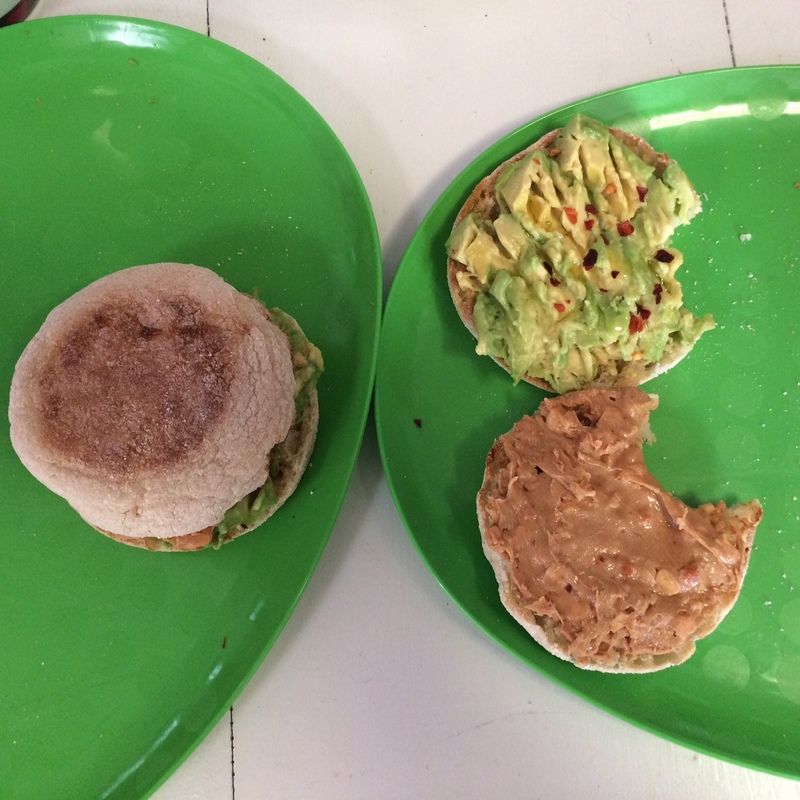 One of us put the two sides together making an avocado peanut butter sandwhich. The other kept the two apart for two distinct flavors. Sunrise Cafe, Yellow Springs, OH: This restaurant is worth a drive. The dishes are unique, well thought out, and prepared individually. This is a high quality, real food place with prices that are more affordable than the plate warrants. Sunrise also offers a wide variety of beers, wines and cocktails. All around, an absolutely lovely experience. Young's Dairy, Yellow Springs, OH: Ice cream... This dairy allows visitors to hang out with the goats and cows, play mini-golf, eat a complete meal, and/or just eat ice cream! It was, sadly, too cold to play mini-golf. The goats were dog-like friendly, cows less interested, and the ice cream was deliecious. The cold did not stop us from eating ice cream! Calypso Grill and Smokehouse, Yellow Springs, OH: Brand new Caribbean restaurant by the same folks that own and opperate the Sunrise. The food was delicious, and they offer a flight of rum tasters which was fun to share. Nick's in Xenia, OH: We drove by this place driving to and from our camp and Yellow Springs. It looks unassuming and like the sort of place that might be exclusively local. Turns out, it IS very local, but also very welcoming. Nick's is a very well established staple of this town, and the food and beer selection was great. Flywheel Brewing, Elizabethtown, KY: We stopped on our journey from TN to OH right about noon which is often a slow time for breweries. We were served some great beer and joined in the silly conversation and soccer-game watching. Elizabethtown doesn't have much, but this brewery is a good start to the growing fun-side of this town. Yellow Springs Brewery, OH: Anne has been drinking their Show Boat all over town. It has become a popular beer for them. They had nothing dark for me to try, but they offered a few other local beers on tap as well as soda and some wine for the non-beer folk. Devil Wind Brewing, Xenia, OH: As we sat drinking our beers, we heard someone say that this place has only been open for a week and a half. We thought we must have mis-heard. Nope, it's that new. We enjoyed our beers enough to hang out for a second round. The staff was super friendly and enthusiastic. Best luck wishes go out to these guys!! Terre Haute Brewing, IN: This was our midway stop between OH and MO. We had a grilled cheese with fries and barbacoa tacos. We shared our plates; everything was more delicious than we expected. We both enjoyed our beers. Recommended stop if you're ever in the area. Schlafly Brewery, St. Louis, MO: We are staying within walking distance of this brewery. They have twelve bottle variety packs in stores which contain more beers than they serve at the brewery. The twelve pack of stouts is like a dozen dessert beers... we may need to rent a trailer to haul some home. Caesar Creek State Park, OH: The spillway is an area where fossils can be found. This area is near the trailhead for the rope bridge and waterfalls. The falls are small, but the hike is lovely, fairly short and easy. It was really nice to just get out and breath the air. 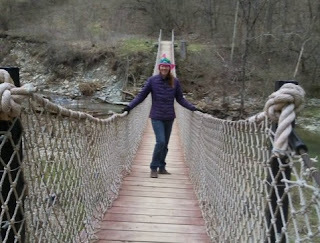 The town of Yellow Springs, OH: This is a great town to "hike." The bookshop, toy store, hardware store, grocery store, second hand store... fun unique shops. Several shops include their own pets. The Maplewood, MO neighborhood: I love neighborhoods that are walkable. This one (we're still here) is turning out to be a great find. Coffee shops, shopping, beer, food... My kind of casual city hiking. Life is good! So good it's hard to keep up with it all! !